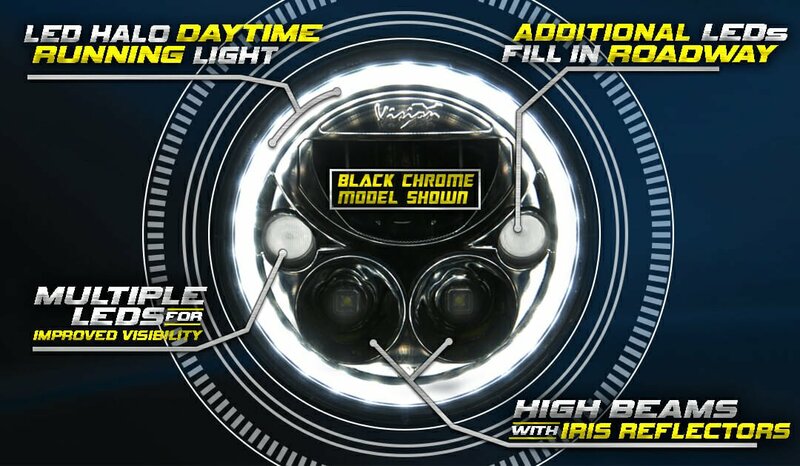 June 3rd, Vision X Lighting, a leader in LED Lighting, is excited to announce the release of the Vortex 7″ Round DOT Approved LED Headlight, available in polished chrome and black chrome finishes. A LED Halo Ring Daytime Running Light composed of 30 LEDs surrounds the edge of the headlight, while IRIS Reflectors wrap around the high beam LEDs for long distance projection. Rated at 4,210 lumens each, the Vortex is dramatically brighter than factory headlights, providing superior performance in terms of road coverage and beam pattern. Coming soon to the UK & Europe. A common issue with aftermarket headlamps is lack of proper road coverage from low beams. After testing multiple different options to counteract that issue, Vision X implemented two LEDs with elliptical lens into the sides of the headlight housing. These LEDs fill in the road space between the vehicle and the low beam, creating a safer driving experience all around. Additionally, the high beams on the Vortex utilize the same IRIS Reflector technology that’s used in the popular Light Cannon series from Vision X. These long-range reflectors help push the light from the high beam LEDs to surprising distances, where as the reflector for the low beam LED was engineered to produce a wide beam pattern to cover the entire roadway. Each beam is precisely positioned to keep light out of the eyes of traffic, ensuring they are unimpaired from the light. A High Four Adapter (P-HLHI4, 9895475) that engages both the low beam and the high beam at the same time is currently available for purchase, allowing Vortex owners to get extra output and increased visibility when using high beams. Jeep JK Specific Kit – A direct plug-and-play kit for Jeep JK owners has also been released (Chrome: XIL-7RDKITJK | 9892733, Black Chrome: XIL-7RDBKITJK | 9892825), and includes a Canbus Adapter (P-HLCBA) to remove electrical interference that may occur (also available as an accessory). This Jeep JK specific kit is available with either polished chrome or black-chrome finish, and has everything you’ll need to get your headlight up and running in no time. Extended Lifetime Warranty – The Vortex LED Headlight comes backed by a limited lifetime warranty from Vision X. The sealed durable UV Resistant Polycarbonate Lens around the hybrid aluminum-polycarbonate housing means the Vortex is protected from debris and comes equipped with an IP rating of 68. The Vortex Headlight has been approved by the Department of Transportation with an E-Mark model also available. Any customer, no matter where they’re located, can enjoy their top of the line LED Headlights worry free.